This heart-shaped pendant flips on its side to create a visually interesting view on such a traditional image. This playful piece is perfect for anyone who likes to stand out in a crowd, since this pendant is sure to be a conversation starter. 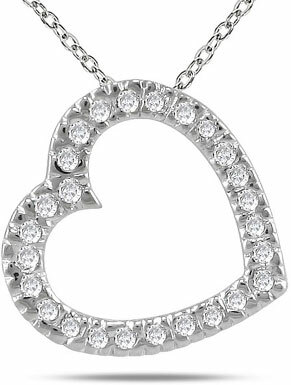 All in all, this 0.25 Carat All Diamond Slide Heart Necklace in 14K White Gold is a keeper! With its hidden bale, the 14K white-gold pendant hangs easily on a gold chain to create an inspiring centerpiece. The heart features a solid gold construction, set with a continuous row of round-cut white diamonds with a 0.25 total carat weight. The white diamonds and white gold are simply beautiful together. At first glance, this necklace may appear as a contemporary shape of some kind until you take a second look and recognize the unmistakable image of a heart. This is a wonderful piece that speaks to everlasting love and promise. We guarantee our 0.25 Carat All Diamond Slide Heart Necklace in 14K White Gold to be high quality, authentic jewelry, as described above.